Spiso Parsley has a mild, fresh flavour and is used in various cuisines for marinating, stuffing, seasoning. It compliments soups, salads, sandwiches, potato dishes, rice dishes, fish, chicken, steaks, meat and vegetable stews. We have developed our own facility for making safe and secure transactions. In addition to this, we let the clients free to choose the payment mode as per their convenience. With the aid of diligent team of professionals and modern packaging facility, we can guarantee safe and secure deliveries. Also, we make sure that only high quality packaging material is used for the same. Put aside the looks, it is similar in all aspects to its counterpart the F. Parsley. The only difference one can find would be in this variety's distinctive curly shaped leaves. By SNAPIN™ is a widely used aromatic herb known for its earthy flavour. It blends well with a variety of dry and gravy dishes. Add SNAPIN™ Parsley to pastas, soups, sautéed vegetables, patties, grilled and roast meat for an enhanced experience. 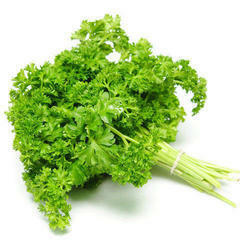 We are one of the reliable companies in this domain and are into offering Green Parsley. Our company has created niche in the field of offering Flat Parsley Leaves.